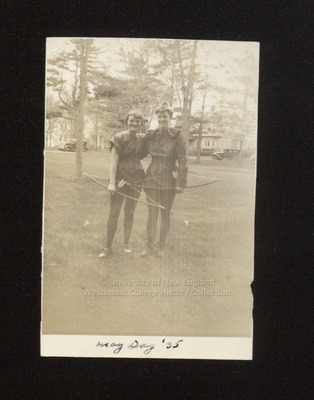 Two Westbrook Junior College students stand side by side on the campus Green dressed in archers costumes in this sepia toned candid snapshot labeled May Day '35 on the front. On the back of the photo is written in blue ink: Sheehy & Cole. The two young women wear tights and "Robin Hood" archery tunics and hats. They hold bows and stand with their arms around each other. Behind Sheehy and Cole is Johnson House, on the other side of College Street, and two automobiles.